Shane Lowry boosted his chances of a Walker Cup call up when he finished joint third in the Lytham Trophy for the second year in a row. 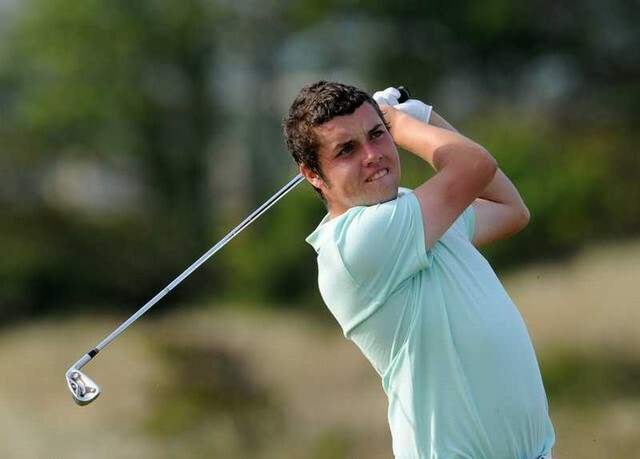 The 22-year old from Esker Hills closed with a three-over par 73 to finish three strokes behind surprise winner James Robinson on 10-over par at Royal Lytham and St Annes. The Irish international went into the final round just two strokes behind leader Dale Whitnell of England, despite dropping five strokes over the last four holes of a third round 75. But he had to settle for a three-over par 73 on a day when none of the 44 players who made the cut managed to break the strict par of 70 in either the third or fourth rounds. Welshman Ben Westgate looked set for an emotional victory following the death in a car crash of 19-year-old team mate Ben Enoch on the eve of the event. He set the early clubhouse target at 288 thanks to a level par 70 but was eventually overtaken by Southport and Ainsdale's Robinson, who fired four birdies and four bogeys in a joint best of the day 70 to finish on seven-over par 287. Overnight leader Whitnell need three closing pars to force a play-off but bogeyed the 16th and double bogeyed the last for a 75 that left him tied for third with Lowry, fellow countryman Jack Senior and Scotland's Wallace Booth on 10 over. Castle's Dara Lernihan shot a pair of 77s on Sunday to finish tied for 31st on 301. 291 Alexandre Kaleka (Marcilly-Orleans) 74 74 73 70; Farren Keenan (Sunningdale) 76 70 74 71; Stiggy Hodgson (Sunningdale) 73 70 74 74; Keir McNicoll (Carnoustie) 74 70 72 75. Other Irish 301 Dara Lernihan (Castle) 76 71 77 77. Irish Open bound Shane Lowry gave his Walker Cup selection hopes a boost when he fired a four-under par 66 to take a two-shot lead after the first round of the Lytham Trophy. Shane Lowry can still win the Lytham Trophy despite a nightmare finish to his third round.